Lab Supply has a huge selection of personal protective equipment for animal laboratories and facilities. 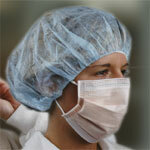 Our selection includes disposable surgical masks from Life Science Products. These surgical masks are perfect for facilities that need to keep a sterile environment, while also protecting their workers. The face masks with surgical ties that we offer are a low cost and effective product that work well for general purpose tasks in facilities. The personal protective equipment is important to the facility workers as well as the subjects of the studies being conducted. Be sure to keep your employees safe with these face masks with surgical ties from Lab Supply. If you are interested in this product, then please click here to see our selection of face masks in our store. Here at Lab Supply, we are committed to making sure you find exactly what you are looking for. If you have any questions about the surgical masks that we offer, then please click here to visit our contact page. We will be more than happy to answer any questions you may have about the products we offer.